Oil climbed above $100 a barrel in New York to a five-month high as Enbridge Inc. said it will reverse the direction of the Seaway pipeline, adding an outlet for crude from the central U.S. and Canada. Futures surged 3.2 percent after Enbridge agreed to acquireConocoPhillips (COP)’s share of the pipeline that runs between Cushing, Oklahoma, and the Gulf Coast and announced the reversal. The change may alleviate a bottleneck at the Cushing storage hub that has lowered the price of benchmark West Texas Intermediate against other oils. Crude for December delivery rose $3.22 to $102.59 a barrel on theNew York Mercantile Exchange, the highest settlement since May 31. Futures are up 12 percent this year. Brent oil for January settlement dropped 30 cents, or 0.3 percent, to $111.88 a barrel on the ICE Futures Europe exchange in London. The European contract’s premium to West Texas crude narrowed to $9.28 a barrel, the smallest spread since March 8. The differential surged to a record high of $27.88 on Oct. 14. 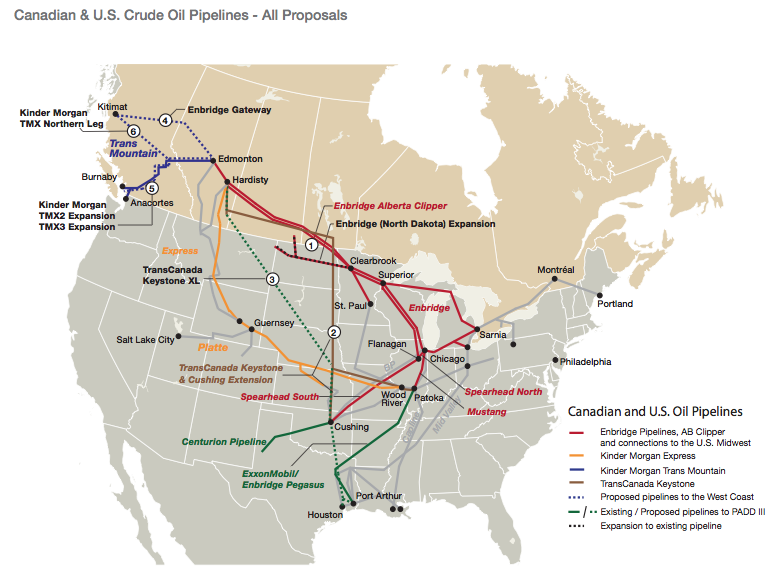 The announcement comes after the U.S. State Department said Nov. 10 that it will delay a decision on TransCanada Corp. (TRP)’s proposed Keystone XL oil pipeline to study an alternative route for the $7 billion project that avoids environmentally sensitive areas in Nebraska. 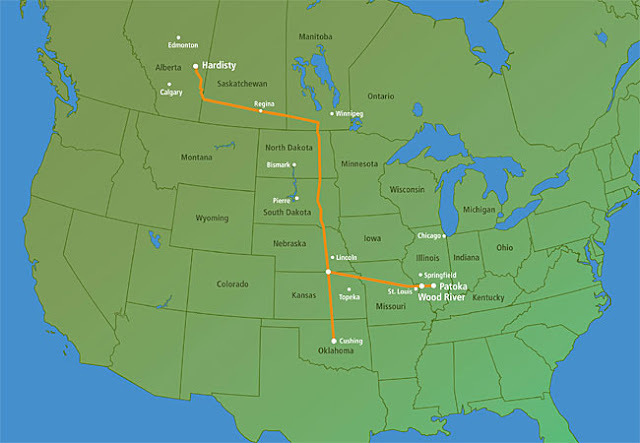 The 1,661-mile (2,673-kilometer) link would deliver 700,000 barrels a day of Canadian oil to the Gulf. The Seaway pipeline will operate with an initial capacity of 150,000 barrels a day by the second quarter of 2012, the company said. Pump modifications expected to be completed by early 2013 will boost daily capacity to 400,000 barrels. Enbridge will jointly own the link with Enterprise Products Partners LP (EPD), the operator, the companies said today. The reversal will enable more oil from Canada and North Dakota to reach the Gulf Coast, home to about half of U.S. refining capacity. Rail and barge projects that are planned, proposed or under construction may boost North Dakota’s oil- loading capacity by 450,000 barrels a day next year, Goldman Sachs Group Inc. said in an Oct. 4 report. The reversal “will definitely reduce the amount of rail and barge that is needed,” said Hussein Allidina, the head of commodity research at Morgan Stanley in New York. “You are still going to evacuate some crude via some of these higher-cost transportation means” as Canadian and U.S. output rises. Oil in New York has surged 36 percent since touching $74.95 a barrel on Oct. 4, the lowest intraday price since Sept. 24, 2010. Prices tumbled 17 percent in the third quarter, the biggest quarterly decline since the financial crisis in 2008 on concern that the U.S. and European economies would slow. Futures in New York have settled above the 200-day moving average since Nov. 7, forming technical support. The 200-day average stood at $95.22 today. The next resistance is around $105, the 76.4 percent retracement of the drop from this year’s high of $114.83 on a Fibonacci study. Oil briefly pared gains after the U.S. Energy Department reported that crude supplies at Cushing rose 890,000 barrels to 32 million last week. Nationwide crude oil stockpiles fell 1.06 million barrels to 337 million, according to the report released at 10:30 a.m. in Washington. A 1.2 million-barrel decline was expected, according to the median of 13 analyst responses in a Bloomberg News survey. Oil volume in electronic trading on the Nymex was 1.11 million contracts as of 3:12 p.m. in New York, the first day over 1 million since Oct. 25. Volume totaled 743,768 contracts yesterday, 12 percent above the three-month average. Open interest was 1.36 million contracts.